After taking to the road over 22 years ago and touring all over the world the phenomenon returns with its latest brand new incarnation “Voodoo VaudEvil”. The spectacular features an amazing amalgamation of bizarre & fantastic circus acts acts all woven into a sensational shock/horror story and the darkest of magic – taking the show to a whole new level. The show is driven by a mainly original soundscape & performed with a forked tongue firmly in each cheek, you’ll certainly Die Laughing. ‘Fantastic, that’s what I call entertainment’ – David Hasselhoff. ‘That was incredible’ – Ant or Dec (never know which ones which). ‘You have to go & see this if, one day something will go wrong & you will be able to say I was there’ – Graham Norton. Annually the Circus of Horrors plays over 100 UK theatres and this tour has expanded to take in festivals throughout the world including The Fuji Rock Festival in Japan (twice), the Wacken Festival in Germany plus shows in Chile, Uruguay, Holland, Belgium, Argentina, France, Italy, Ireland, Finland, Hong Kong and Moscow where it became the 1st UK Circus ever to perform in Russia. The show also played an astounding 10 nights at London’s O2. This is not the first time that The Circus of Horrors has created history, as it became the only circus ever to reach the finals of Britain’s Got Talent and the first circus to perform in London’s West End for over 100 years. The Circus of Horrors started it’s gruesome beginnings at the 1995 Glastonbury Festival and became an instant hit, touring all over the world from Chile to Chatham, Argentina to Aberdeen, Japan to Jersey including festival appearances with Alice Cooper, Ermine, Motley Cure, Oasis, Iron Maiden, The Manic St Preachers, Food Fighters and many more. 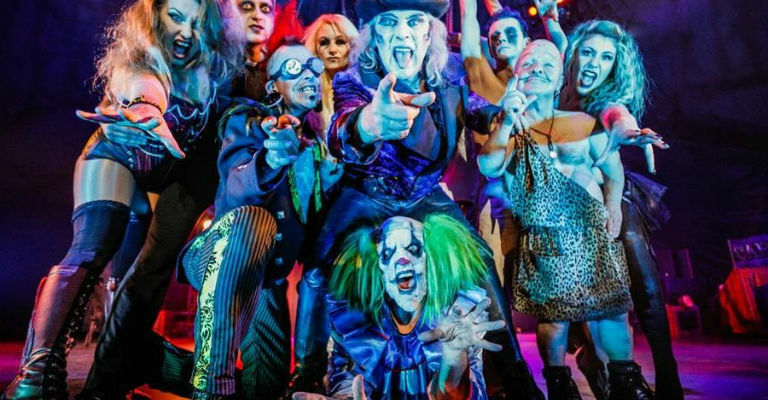 ‘The Circus of Horrors completely WOWED the audience’ – The Daily Mail.